Finally made some sawdust again on Saturday, first time in a long time. The cheap plastic espresso tamper that came with our espresso machine disappeared last week, must've fallen into a trash bag or something because I looked everywhere. It was the kick in the pants I needed to finally make myself a nice one. It came out very well, fits the portafilter perfectly (shocker, it was custom made for it afterall), and fits my hand perfectly as well. It's a touch large for prosicated's hand, she's requested a slightly smaller version for her to use. 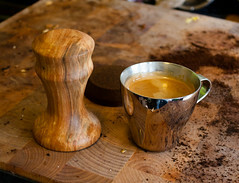 I do not have a wood-love icon, but I do have a coffee one. At some point I should tell you about working in a sign shop. One of the ways I ended up snagging the attention of my now-spouse is that I have a favorite wood (cherry) and my dad turns wood and once manufactured lathes as part of his business. I LOVE spalted! Almost as much as I love burls. Mind you, I don't do that kind of wood work, so of course I can love the things that are hardest to make into finished things. Yeah, spalted and burled woods always catch my eye more than anything else. A pain they're so difficult to deal with. Verrah nice! Useful tools should be pretty too, I think. I love when functional items are pretty, too! I love the feeling of having done something so incredibly simple and terribly clever at the same time. This is a perfect example. And, I might add, very nicely done! That's why I like woodworking, it lends itself to those moments. Any chance I could commission a plunger to replace the cheapo plastic thing that came with the grinder attachment for the stand mixer? Yeah, that's the one. Let me know if you need materials or sumpin'. That's beautiful! You have a lathe!?! lucky dawg. You're welcome to spend some time with it, I have a well equipped little basement workshop that I'm more than happy to have company in.